Aguilar at her work station. 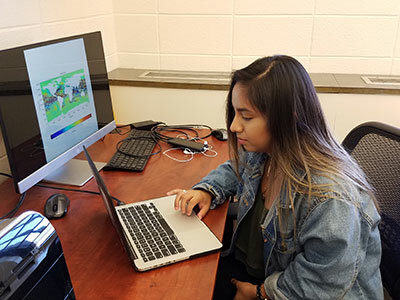 Perla Aguilar ’19 is a mechanical engineering major who worked on analyzing satellite data taken from various organizations like NASA and the European Space Agency to study oceanic heat transport for her Xerox Fellowship Project. The swirling structures she studied, called eddies, typically 100 km in size, are the strongest structures in the ocean, but little is known about how they affect heat flow from the equator to the poles. Along with learning about eddies, Aguilar also worked to reach out to local high school students, getting them interested in research. She is hoping to format her data to be projected onto the Science on a Sphere at the Rochester Museum and Science Center (RMSC). Aguilar took two core courses in mechanical engineering in her junior year – Fluid Dynamics and Heat and Mass Transfer. Intrigued by the material, she “wanted to use the information I learned in class somewhere outside of class.” Aguilar reached out to Assistant Professor Hussein Aluie and applied to the Xerox program, and she says the coursework played a big role in understanding the work she is doing now. In the lab, she compiled daily observations taken from the satellite over the course of a year. Using Python, a common programming language, she formatted the data into video files to observe motion of ocean currents and heat flows. Aguilar actually learned to use Python during this Xerox project. Aguilar hopes that this experience will help her decide whether or not she wants to go into graduate school, and if she’d enjoy working in industry. She wants to become an expert in her field, and working in this lab, she sees that expertise comes from hard work for a long time in a specific area. She has learned not only a new programming language, but the importance of visualization to understand data. She also has learned the importance of sharing her work with confidence and getting others to engage in it. Perla updating Aluie on her work. 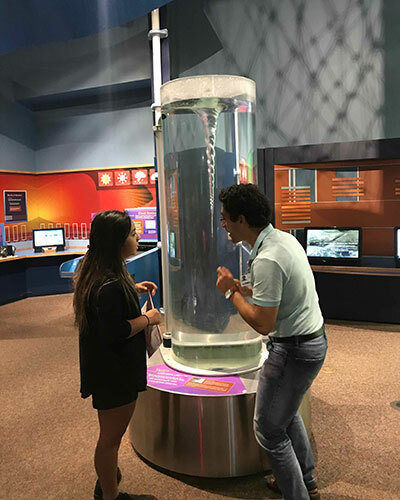 Aguilar and her advisor Professor Hussein Aluie at the Rochester Museum and Science Center.